Series 5 of the Nightmare Before Christmas Minimates will keep you up at night! 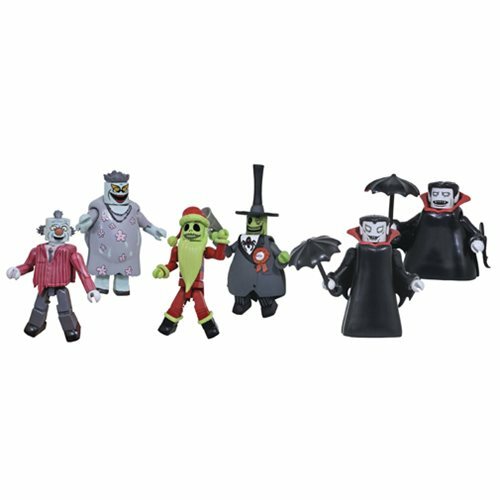 The cast of creepy characters expands with three 2-packs: Glow-in-the-Dark Santa Jack with Glow-in-the-Dark Mayor, the specialty-exclusive Corpse Dad and Corpse Mom, and two exclusive Vampires! Each 2-inch Minimates mini-figure features up to 14 points of articulation with fully interchangeable parts. Each 2-pack comes packaged on a full-color blister card. Ages 8 and up.